Tom Njovu, who plays the popular “Limbikani” character in the local hit TV soap “Banja,” was one of the original members of Africa Directions. He joined the theatre group in 2000 when AD was first opened. 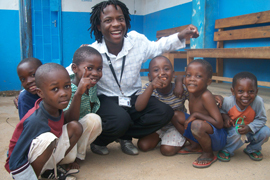 When he was growing up in Mtendere, Tom says there were no real role models for youth. Kids from the area often shied away from more affluent areas because they felt embarrassed and that they didn’t belong. However, when Africa Directions opened its doors, all this changed. AD welcomed youth from Mtendere as well as the surrounding areas and introduced them to many successful and inspirational people. Tom became confident interacting with people from different walks of life and discussing issues that affect youth everywhere. These talks challenged him to think about the future and start setting goals for himself. As a member of the theatre group, Tom was able to refine his skills in acting and dance. In addition to actively participating in local productions and community outreach, he was fortunate enough to travel with AD for festivals and exchanges in Zimbabwe, Ethiopia, South Africa, Swaziland, and Zanzibar. He also gained valuable experience writing and directing through his participation in many workshops and trainings at the centre. Although there is no official school of arts in Zambia, Africa Directions gave him an excellent foundation in these areas. Between his mentors and friends at the centre and the exposure to other cultures and high- profile people, Tom developed a great confidence in his abilities; he started believing in himself and set no limits to what he would achieve. Africa Directions gave him yet another opportunity when they employed him as co-host for the youth radio chat show, Bauze, on ZNBC Radio 4FM. Here he fine-tuned his presentation style and English skills. It was around this time that Tom auditioned with Muvi TV and was given the lead role of Limbikani in “Banja.” Tom excelled at this new position and became one of the leaders of the production team. When the original series wrapped up, Muvi asked people to bring forward concepts for the next show. Tom’s concept was selected and developed into what became the most popular local soap on television. In addition to acting as Limbikani, Muvi TV recognized Tom’s talent behind the camera and made him the director of photography and art for the series. Tom continues to climb the ladder of success with his most recent career move. He recently landed a position as a cameraman with ZNBC, bringing him back to the very same building he used to frequent as an overly- ambitious child. As for now, Tom is quite content. While working at ZNBC, Tom plans to go back to school part-time to upgrade his CV. After that, he is open to exploring whatever opportunities come his way. With this attitude and such talent and ambition, Tom is sure to continue to grow and do great things with his life.